... Then choosing a page in Apostrophe's page tree. 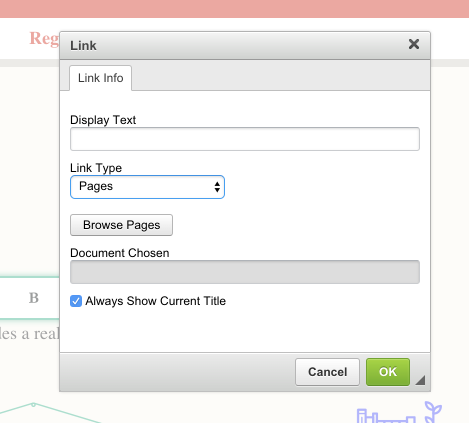 Users can click the usual "link" icon in the rich text editor, then pick "Document" from the "Link Types" dropdown menu. Now they can click the "Browse Documents" button and select the page they wish to link to. The resulting link will always stay up to date, even if the page moves around the site and its slug changes. This is the main advantage, in addition to the simple convenience of picking a page via the page tree. You may successfully create permalinks to any type of document that has a _url property when loaded, i.e. pieces that have corresponding pieces-pages, as well as regular pages. This is particularly useful if you're including something like apostrophe-file as a join option. By default, the new item on the "Link Type" dropdown and the "Browse" button both get labels based on the type of document you are joining with. But if you want to change this language, or you are using an array of types and find the word "Documents" underwhelming, you can set the browseLabel and typeLabel options of this module as you see fit. However, for their convenience, if they click on it while the rich text editor is not active, it will still redirect to the right place. The link will always point directly to its destination for all other site visitors, including search engines, which means the SEO is good. On each page load that actually features permalinks, there is a small performance hit to load information about the current location of all the pages being linked to. However Apostrophe makes an effort to load these collectively rather than one at a time. There is no significant performance hit on pages that don't have permalinks.